Hayman Reese Weight Distribution Systems improve safety, handling, control and comfort when towing. 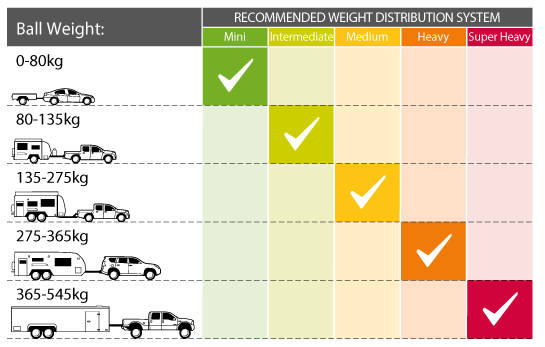 Choosing the right Weight Distribution System for you? 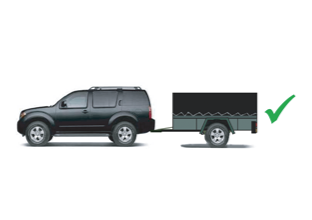 To determine which Weight Distribution System is most suitable for you, first weight your caravan, camper trailer or trailers ball weight. We recommend you use a Ball Weight Scale to do this. Generally most caravans, camper trailers or trailers manufactured in Australia have a ball weight 10% of the laden weight. But always remember, you need to consider everything you put into the caravan, camper trailer or trailer, including water, gas bottles, food, luggage, etc. as this will have a direct affect on your ball weight. The laden weight is often underestimated in Australia and this can become a problem when trying to balance your caravan, camper trailer or trailer and tow vehicle with equipment that is not up to task. Once you have determined your ball weight, record it and retain for easy review. Now that you have your ball weight, use the chart below to determine the correct size of Weight Distribution System required.